Call us at (08) 6555 4900 as soon as possible, ideally before 9 am so we can fit you into our schedule. Though we always prioritise same-day emergency appointments we cannot guarantee them, so please contact us straightaway. We also can provide advice to you over the phone if you are experiencing a dental emergency. Experiencing persistent throbbing pain that’s disrupting your sleep? If you also have swelling, a fever and a continuous reaction to cold, heat or pressure, you may have an abscess. For temporary relief until you can see us, rinse your mouth with lukewarm salt water. Applying a cold compress to the outside of your cheek also may offer short-term relief. If you lost a tooth due to an accident or sports injury, we might be able to save it. It will be necessary to see one of our dentists within a half hour of losing your tooth so it can be replanted back into the socket. Hold the tooth by its crown, not the roots. Ideally, you should put the tooth in milk and get to our office as quickly as possible. The tooth also can be wrapped in clean gauze or plastic wrap. A broken or chipped tooth doesn’t always cause pain, but it needs to be addressed. If you experience intermittent pain (at a level of 5-6) that is relieved by medication, and you can sleep you may wait a week or so until seeing us for care. 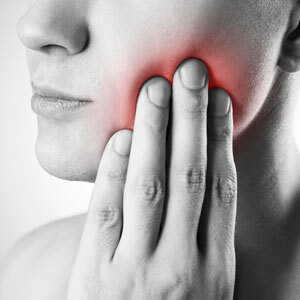 If your symptoms worsen and your pain level rises above a 7, then you should see one of our dentists within 24 hours. Placing a cold compress on your face near the injured tooth can provide temporary relief until you can get into the office. Wires from braces or retainers can sometimes cause discomfort. Contact your orthodontist as soon as possible. In the meantime, soft wax or sterile gauze can be used to cover the part of the brace wire that’s causing pain. If your appliance becomes loose, one of our dentists can temporarily cement it in place until you can see your orthodontist. Although a loose or broken bracket will probably be okay for a few days, you may need to alter your chewing habits until you see your orthodontist. If you accidentally bite your tongue or lip to the point that it causes bleeding, apply direct pressure to the area, using a clean cloth. If you have swelling, apply a cold compress. If the bleeding doesn’t stop promptly, see us straightaway or go to the hospital. If you are experiencing a dental emergency, contact us as soon as possible!